We sell a lot of work boots here at the Working Person's Store. Men's boots of all different varieties and specifications. But let's face it; an awful lot of this work footwear is boring to look at. Why should not you be able to enjoy some fine Western style while ... (see full details) (see specifications) #CHP29406. We sell a lot of work boots here at the Working Person's Store. Men's boots of all different varieties and specifications. But let's face it; an awful lot of this work footwear is boring to look at. Why should not you be able to enjoy some fine Western style while you're on the job? With a pair of great looking Chippewa Men's 29406 Brown 10 Inch Lace-Up Leather Boots, you'll have the style you want with the durability and reliability you need. With their great Western style, the Bay leather uppers are something to behold. They're both attractive and durable. The tough Goodyear leather Welt construction ensures that these great looking Chippewa boots will be solid and repairable for years and years. To give you extra support, there are triple-ribbed steel shanks and 4 iron rubber/6 iron robus combination midsoles within the lace-up boots. Speaking of laces - these offer heavy duty wax Sta-tied laces, for your convenience. The Vibram nitrile yellow plug outsoles are some of the best on the market. They're both ultra-durable and shock-absorbing, and they also provides excellent traction. You'll have little problem staying on your feet with the oil- and slip-resistant outsoles. Cushioned Texon insoles offer additional comfort, and the drill vamp lining in the brown will keep your feet dry by wicking moisture away from your skin. Express yourself with your slip-resistant boots! Get all the great features of high-quality men's footwear along with fantastic Western style. The American-made Chippewa Men's 29406 Kiltie Lace-Up Leather USA-Made Boots are great for getting the job done while also indulging your inner cowboy. The Chipplewa Arroyo Kiltie western 29406 boots are a real head turner in a good way. In my opinion these boots look incredible and that is why I decided to finally pull the trigger and purchase them. They have served me dutifully over the past 7 months. The leather is high quality and thick meaning that they will resist most damage. The heel is great for adding an extra two or three inches, so all smaller guys consider these strongly. They are also American made and where I'm from that still means something. Great boots overall highly recommend. These are a great pair of boots. They are true to size and the leather is very durable. That being siad they took a while to break in, with several coats of Neat's Foot Oil, however it was well worth it. They provide a substantial amount of ankle support, and the heel is not too high. Once broken in they are comfortable enough for all day, hard use wear. I highly recommend these boots. And by the way, they're made in America, in Womelsdorf, PA. The pair of Chippewa Lace Up Boots I now wear are over 15 years old! I wear them for riding, and working every day. I use neat foot oil and Aussie butter to keep them supple, and looking good. I recommend this boot for anyone. I will be ordering another pair in a few months. These old boots have served me well, and will be donated to our local museum when I receive my new ones. These boots are very comfortable once broken in. The break in period took longer than I thought it would, but it was worth it. They provide excellent ankle support. The soles give great traction. Don't polish the leather. I use Neat's Foot Oil and it helps break in and keeps them looking new. I highly recommend these boots. And they look good, too. 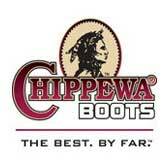 Chippewa Boots: Men's USA-Made Brown 29406 Lace Up Western Boots is being added to your cart.